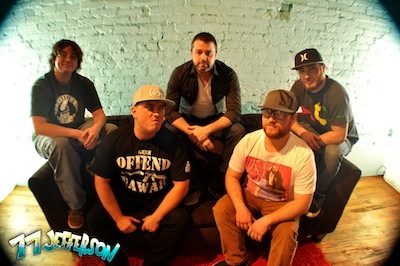 77 Jefferson singer Joel Castillo catches up with Musicbailout to share thoughts on the band’s development and Rarities Volume 2 - the newest from this Kansas City-based reggae quintet set to release on May 12th. I’m thrilled to hear you are currently in studio finishing up Rarities Volume 2 – what motivated the songwriting on this album and what kinds of threads are consistent throughout the tracks? Joel: The most fun thing for us on a Rarities album is that we don't have to stay consistent or stay within a certain theme or feel. Before, during, and after recording ‘Truth & Love,’ these songs and ideas would pour out but maybe didn't quite fit the theme of the current project. This gives us a chance to put these songs out and have a lot of fun doing it. The motivation for the songwriting on this album really stays the same for us right now. It's just real life and things that inspire us. For me, it always seems to be based around love, which is not necessarily intended. But, I'm fine with it, and so far, our fans seem to enjoy it as well. Share some about how Rarities Vol 2 builds upon the first volume and in what ways is it set apart from Vol. 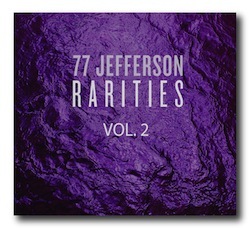 1 and other 77 Jefferson albums? Joel: The idea of the original Rarities was to put together something that had a wide range of sounds as far as beats, dubs, acoustic tunes, remixes - something that felt like it wasn't all recorded in one studio session, but in different studios and at different times. Something that sets this one apart from the last Rarities is that we are featuring more special guests than we ever have on an album before. There are a lot of people that we would love to work with that we are friends with as well as fans of, and we are getting the chance to do that with this album. And, it's feeling very natural. I really think people are going to enjoy the collaborations, and, if they don't already know the artist, they will definitely be a fan after hearing their verse. You’ve released a video for Likkle Bit featuring Spawnbreezie, whose voice adds such great soul to the song. You’ve historically collaborated with other artists, such as Josh Heinrichs. Which other musicians are featured on Rarities Vol. 2, and what other bands you hope to collaborate with in the future? Joel: Definitely! Besides Likkle featuring Spawn, we are collaborating with Cas Haley, SkillinJah, Jah Maoli and, of course, Josh Heinrichs. This will be our third collaboration with Josh, and it's always very fun and natural to do a song with him. Rarities 2 will also have a lot more of our co-singer Justin Howard, who joined up with 77 in 2012 along with Kyle Crouse on bass. This will give 77 fans an opportunity to get to know Justin a likkle bit more. As far as in the future, I know all the boys probably have a different idea of someone they would like to work with, and for me it's very hard to say. There are so many amazing singers and musicians that inspire me be it reggae or not. I could just go on for hours. There’s a distinctive quality to the reggae of this region, and I so appreciated the winter backdrop to the video for Likkle Bit. It’s a rarity to see a winter jacket in a reggae video, and as a Chicagoan, I loved it. How do you generate such a striking connection to a reggae vibe in the throes of a snow-filled Midwest winter? Joel: We embrace it, use the changing of the seasons to our advantage. It's like you can feel the mood of a song differently under a dim lit winter sky, as to other songs that clearly have a "summer time vibe.” We get to make that come to life in a video like "Likkle Bit.” It's funny, though, a lot of people ask us how we got into it or how a sound with such a tropical vibe can come so far from the ocean, but really, me and all the boys are just into it. We all grew up with it around in some way or another and feel a strong connection to it. There are some bands out there that aim to sound like a certain reggae group or force it, but the progression and way that we came to be a reggae band was very natural and just continues to grow. I believe that this music can come from anyone and anywhere if the recipe is right, and for us, it's just the perfect mixture. What do you hope reggae and roots rock fans come to understand about the Midwest scene? Joel: I just think that if they give us a listen, they will find it's just as good and legit as many of the others out there. One of America's first reggae bands came from right here in Kansas City. They are called The Blue Riddim Band and still play even today. Josh Heinrichs along with his old band Jah Roots put thousands of people on to reggae in the Midwest, and Josh still continues to do it to this day. I think people are catching on to it. I just hope that the Midwest catches on a little more! For fans less familiar with 77 Jefferson, share some about how the band came together and what propels you to keep generating new material together? What is the experience of an artist recording on GanJah Records? Joel: As far as recording goes, we have always recorded all of our own music with our own drummer/producer Miles Brown. We released "Truth & Love" under Ganjah Records because it was the best thing to do for us, and plain and simple: we love Josh Heinrichs. Josh is a marketing guru, amazing talent, and a good friend. Putting out that string of albums with Lance Sitton, SkillinJah, Josh, and us, and then touring all together afterwards...such an amazing time for us. We have always strived to better ourselves in our craft, which being a musician these days entails a number of things off stage. With all the video, audio, and a number of things that go along with music that we've been doing for so long now, we've decided to release "Rarities Vol. 2" under StayWiseMedia. StayWise is our creation that Miles has been building up to do for a very long time - basically, putting a brand on all the music/video production that is done within the group. BUT, this does not mean that you’re not ‘gonna hear more stuff out of 77 and Ganjah Records. 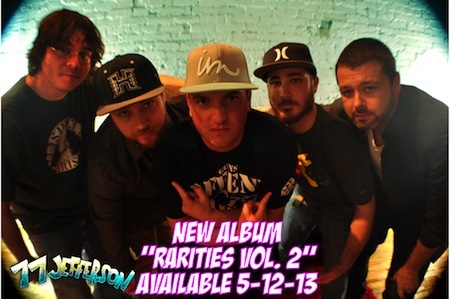 We plan on keeping the tradition strong and making music with Josh for as long as we are still ‘doin the damn thang! The album is set to release on May 12th – what kind of touring can your fans expect to accompany Rarities Vol. 2? Any words for fans of 77 Jefferson? Joel: YES! Thank you for your ongoing support! The fans make it all worthwhile! Be on the lookout for us in your city, and if you think we need to hit your town, let us know what’s up. Thanks to you as well Musicbailout. Big thanks to you, Joel and Miles. Here’s to wishing there’s nothing likkle about the success of your new album and all that lies ahead for 77 Jefferson.